Last year I blogged about how Wirral Council had entered into a contract with solicitors and barristers chambers to keep the hourly rates it was being charged “confidential” (and therefore redacted on the invoices and contract I requested to inspect), when I exercised my right under s.15 of the Audit Commission Act 1998 c.18 as part of last year’s audit to inspect various legal invoices Wirral Council had received and the hourly rates included as part of the North West Legal Consortium Collaboration Agreement. There’s a Management Board for the North West Legal Consortium Collaboration Agreement and a Consortium Contract Manager and last year I asked for their views on the redaction and pointed out that the contract does allow the hourly rates for legal services to be disclosed with the consent of the companies involved. The response I got is detailed in excerpts from two emails below. 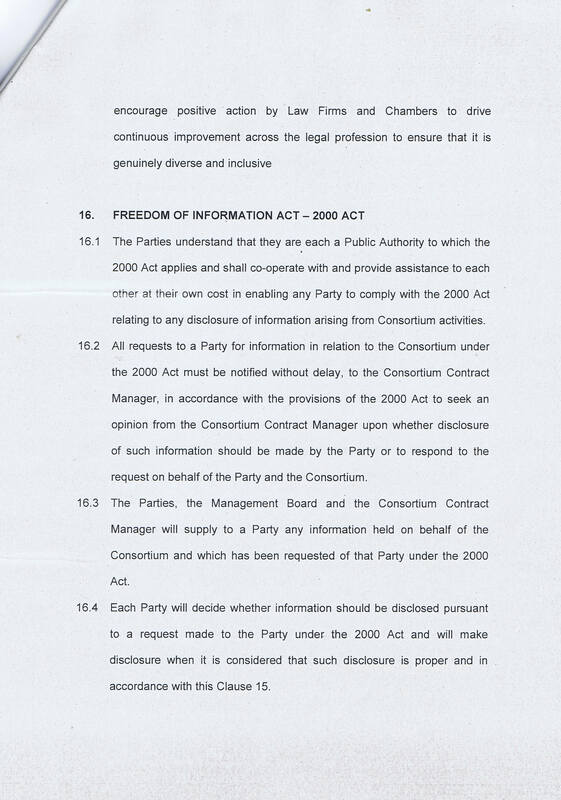 Interestingly the contract also specifies in pages 15 and page 16 that if there are any FOI requests relating to these matters that the Consortium Contract Manager must be notified of any FOI requests relating to it (which is probably why Cllr Ian Lewis’ recent FOI request about the fee Wirral Council paid to the barrister Sarah O’Brien took four weeks to answer. I thought the answer to the question about supplying the legal rates that I received last year from Wirral Council would be interesting to publish here as it runs completely counter to what politicians say in public about the Labour administration being “open and transparent”. I’ve not included the person who sent these two emails as he’s merely passing on a response he’s received and I don’t want anyone to “shoot the messenger”. Your request has been forwarded to the Management Board of the NW Legal Consortium which meets next week. We will get back to you once a response is received from the NWLC Management Board on this matter. Depending upon the outcome of this we can then take a view on your subsequent questions. I am on leave for the next two weeks. If you have any further need to contact us could you please send it to the financial Services coordination e-mail address and copy in my email address. Matters can then be picked up in my absence. Your points have been put to the consortium as requested. The response received is contained below. There was expectation from the bidders that the hourly rates were provided in confidence. The expectation of bidders whilst submitting the hour rates the information would be used only for the purposes of the tenders only. (d) For the reasons described above, disclosure of rates information for legal services could deter legal services providers who may think twice about whether working for public sector clients in the future. This could lead to a market in which the public sector has a diminished pool of legal services providers to choose from (driving quality down and rates up). If you wish to pursue this latter matter further you would probably need to take your own legal advice regarding the contract confidentiality versus the Audit Commission Act. 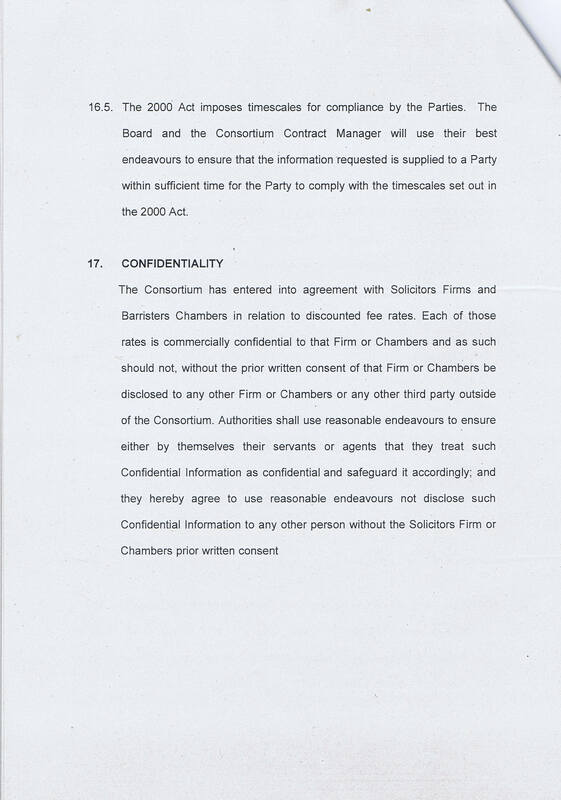 The Council has erred on the side of contract confidentiality. The guidance issued by the Audit Commission regarding inspection rights does state that ‘Your right to inspect the accounts is personal which means the external auditor can not get involved.’ My reading of this would mean that neither Grant Thornton nor the Audit Commission would be able to provide a view on this issue. If Simon Goacher (former Wirral Monitoring Officer during its abusive heyday) is now head of Local Government at Weightmans, which he in fact is, then these associations may come into play, and despite the best efforts of Joyce Redfearn and her highly remunerated gang of LGA improvers, movers and shakers, they ain’t gonna be clobbered by a new dawn of openness and transparency are they? Ah yes Simon Goacher, was he the person at CWAC that was involved with coming up with a compromise agreement that meant you couldn’t exercise your statutory Freedom of Information and Data Protection Act rights until a QC came along and pointed out to them that people can’t sign a contract signing away their legal rights? However s.15 of the Audit Commission Act 1998 only allows information to be withheld that falls under subsections 3 to 5 (for example how much an individual member of staff at Wirral Council is paid). There’s no exemption in the legislation for withholding the hourly rates of a contractor on grounds of commercial confidentiality. I knew mixing politics and religion on this blog was probably a mistake! However my middle name is Michael. A little off track by returning to BIG in a current blog. Firstly I must say how invaluable your record of proceedings at WBC is to the collective memory..that is a tribute. Re-reading Cllr Davies’s comment above it does remind me of “the equivocation of the fiend, to win us with honest trifles whilst betraying us i the deepest consequence”. Here how will financial anomalies ever come to light when the files are secreted away? Guilty parties who have received the grant are not going to come forward , are they!! So the above is meaningless unless he feared that I had more examples which I had held back. Why did he not say “I will ensure a thorough review of all 26 of the applications backed by wirralbiz given that the random sample of 6 have produced 100% error”? I remember the executive summary that was released yes. You are right that political issues can stretch over meetings over months (or even years). The official minutes are just a rather (at times) anodyne record of what was said and decided whereas video captures every word of what a politician said (and how they said it). In other words by releasing the executive summary to the BIG report and saying what he said, there’s the hope that this will limit greater exposure of more important (and probably more embarrassing details). Even if the files are “secreted away” people will know what’s in them. The truth of the matter is that whistleblowers “know too much” and what they put in the public domain is generally the tip of a very large iceberg. The rest of the iceberg is generally stuff that could get people fired, subjected to disciplinary procedures or dragged through the civil and/or criminal courts for alleged breaches of the law. He’s probably repeating an answer he’s been told to say by officers. Do you really think that Cabinet Members are such masters of their brief that they write their own answers to questions? Yes and it will have been the officers that gave the lame apologia for companies 1-6 which Grant Thornton are at pains to declare that they cannot vouchsafe. Well I do have other files which when checked were not kosher. If I can be fagged I will find them and submit them to Mr Davies. One of the most curious matters here is how the subcontractor Fieldcrest Ltd who performed the work pp wirralbiz continued even as these revelations were made, and after his allegiance transferred direct to invest Wirral in July 2011, to work on the BIG fund right up to September 2012 when the spending freeze was placed. Now given that one of these files quite rightly was given to the police that is a curious example of the “inviolability of officers” to transcend common sense and justice. Surely it should be companies 1-6 that offer any explanation as to what happened rather than Wirral Council on their behalf? The issue of subcontracting is a vexed one as it relies on staff employed at Wirral Council to monitor compliance with the contract, but also provides a scapegoat in the form of the subcontractor should things go wrong. When subcontractors then further subcontract the contract it makes the lines of governance and accountability even more blurry. As to the status of the Merseyside Police investigation, as with Wirral Council I just get stonewalled by both organisations if I ask such questions. Mind you somebody described me as a “friendly Rottweiler” recently so maybe that’s why! A most pertinent point, a hit , a palpable hit. Such companies were not bound by the investigation and rather like wirralbiz, could refuse to collaborate with Grant Thornton. The majority of the anomalies were easy to spot on the budget applications , or by reference to publicly filed documents at Companies House so co-operation from wirralbiz , and from the grantees, would not have been necessary, The errors were truly absurd and detected by myself on a perfunctory examination. The council officers clearly, and correctly, felt themselves to be the target, for their complaisance and lack of expertise. It is interesting to note that in May 2011, before ever the files went to Counter Fraud, it was reported back to me by a wirralbiz director that Invest Wirral had conducted an investigation using an external qualified accountant (lucky for him/her we don’t know their identity) which had cleared the subcontractor, and like your comment , was focussed on the grantees.Nevertheless nothing happened, and here is a strange thing , when James Griffiths went to see Adderley and Basnett (early July 2011)he came away convinced that Basnett knew nothing of the scandal. P Basnett being the Head of Invest Wirral one would imagine that she ought to know of a prior investigation..When P. Basnett and D Bradbury followed up with an snap interview with myself I too was not sure that P Basnett had previously been aware of the scale of the problem. The infamous “lie” that K Adderley might have told J Griffiths may instead be an untruth,that no BIG company had gone bust, in that he too could have been unaware of the scandal. The villain of the piece might have been D Bradbury who had day-to-day dealings with wirralbiz and frequent contact with P Davies of Fieldcrest, and who would have been in a position to occlude the matter.Certainly in our interview she was the angry lady whereas Mrs Basnett was white of face, like a rabbit in headlights, who later privately approached me and asked for me to provide all the files to her for onward transmission to Counter Fraud. Overall it is bad that we know nothing of the remaining 20 files prepared by wirralbiz via employees and via Fieldcrest. I can exclude from that statement one file which again was rejected by the supervising accountant only to re-surface and obtain a £20,000 grant. The objection raised by Bob Neeld was that that company had not demonstrated need-and I concur with that analysis.So 7 out of 7 have anomalies from where as a trained auditor I would conclude that at the very least the sample should be extended by another file. Those who do not know their history are doomed to repeat it- that is why the WBC NEEDS to wash its dirty linen in public. Wirral Council tried washing its dirty linen in public once back at the start of 2012 with the release of the AKA report and the political fallout from an irate public led to a successful vote of no confidence in the Leader and a change of administration from a minority Labour to Con/LD administration. However it’s up to the voters in May as to who they want to see running Wirral Council. If the errors were so easily spotted they should have been flagged up by officers, if not them the panel and if not the panel I presume reports were going to Cabinet in order for the grants to be awarded (albeit with the tremendous lack of transparency there is around reports considering without the press and public present). The problem with local government then is it was like a house of cards with each committee just looking at things in a very superficial way as they’re each told that someone else (or another committee) has already agreed, recommended or approved it and when there was a culture of trust, it seems awkward questions weren’t asked and even when whistleblowers did raise awkward questions their concerns were brushed aside as opening the can of worms would affect the promotion prospects of some very well paid individuals.